Don’t despair! Help is on its way and we’ve found you a heap of natural ways to stop the snoring and get a good night’s sleep! Check them all out now and Pin your favorites. If you are getting driven mad by snoring in your home, this post is one that you won’t want to miss and a must read. There are a number of factors that contribute to who snores and why. Your sleeping positions, diet, weight and alcohol consumption are a few of the primary reasons. It helps to determine what type of snorer you are in order to really pinpoint how to stop snoring. Taking the time to determine this, and why you snore, can help you find the right solution and get a good night of rest consistently. To figure this out, ask your partner to help you keep a sleep diary to monitor your snoring. By observing patterns in your snoring, you can often determine the reasons why you snore and what makes it worse. With the help of your partner, let’s see if you can pinpoint when you snore. This feedback is invaluable and will get to the root of the issue. If your mouth stays shut while you snore, it may indicate a problem with your tongue and nasal passageways. If you snore with your mouth wide open, this could be an indication that the tissues in your throat are more likely to be causing you to snore. If your throat is partially obstructed, you’re apt to try to force in more air, which creates the snore sounds. Sleeping on your back often causes you to breathe through your mouth. This can make snoring worse. If you snore in any position no matter what, it could be a sign of a more serious problem, such as sleep apnea. Please have a visit with your doctor if your snoring is loud enough to keep your partner awake, you wake yourself up, everything you have tried does not seem to help or you snore in any sleeping position. You may need a more specified approach or more individualized details from a health care provider to determine how to stop snoring in this case. 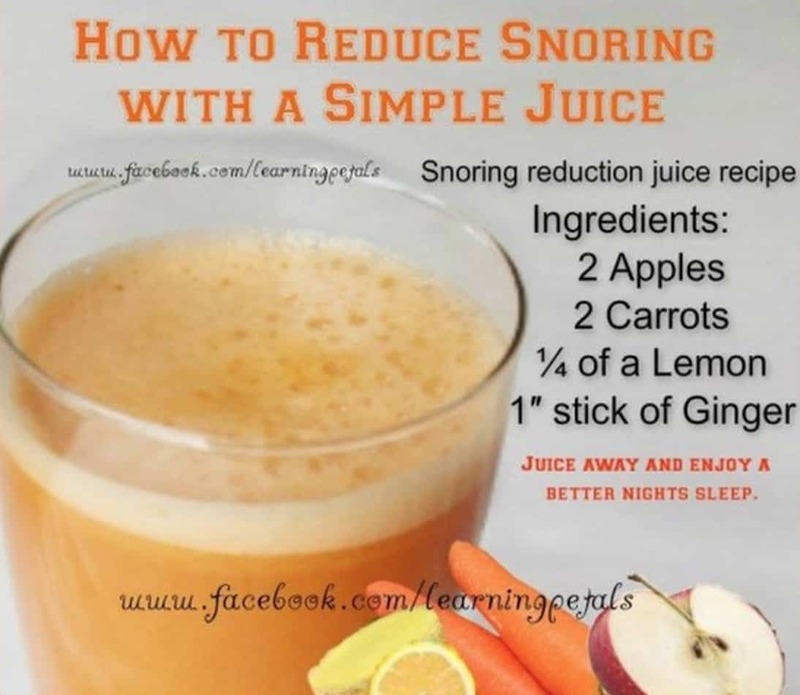 Learn the best tips and tricks from Dr Axe about how to naturally stop snoring fast. He outlines all the changes that you can make in your life that will have an immediate effect. Juice the ingredients and drink prior to going to bed. You will sleep well and notice the difference. 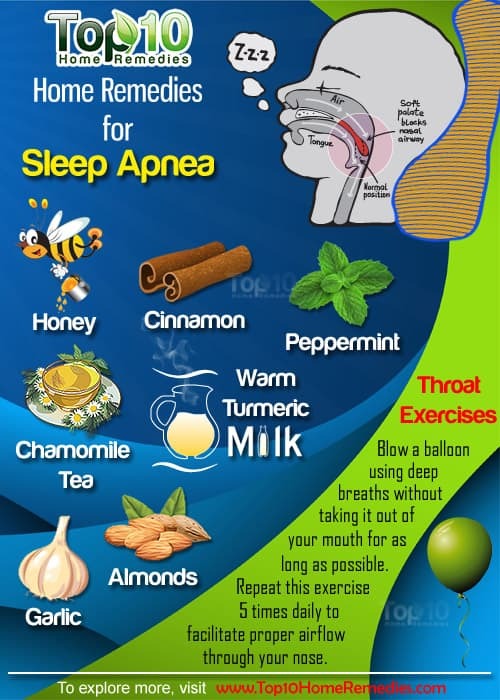 Here’s some great Sleep Apnea Remedies via Top 10 Home Remedies. Warm Turmeric Milk, Chamomile and Peppermint Tea, Honey and Garlic are all good choices. We were particularly interested in the suggested Throat exercise. Blow a balloon using deep breaths without taking it out of your mouth for as long as possible. Repeat this exercise 5 times daily to facilitate proper airflow through your nose. Could this work for you? Maybe a Snoring T-Shirt is the answer! Since sleeping on your side is one of the things that greatly reduces snoring, many people find it hard to remain in that position. A tennis ball attached to the back of a t-shirt means when you roll on your back, you naturally reposition yourself on your side due to the discomfort. What a great idea and definitely worth a try! We were very excited to find this great idea on the One Good Thing By Jilly Site. 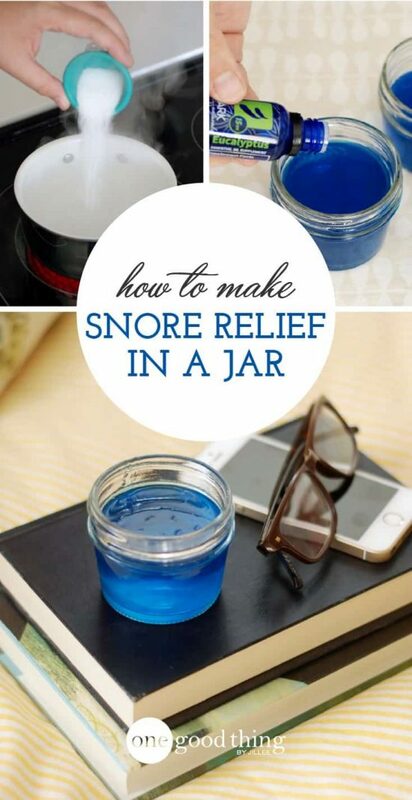 She has created this brilliant Snore Relief in a Jar and you won’t be able to wait to make it. You essentially take a few deep breaths before sleeping and then leave it open on your nightstand. This could be the answer you are looking for!